Imagine yourself swimming in an ocean front infinity pool by the Pacific Ocean. Now imagine yourself in the Jacuzzi ordering Margaritas for you and your neighbor to watch the sunset. Your day started out with a short aerobics class in the indoor lap pool, a smoothie from the Juice bar after wards. You go through your mail in the liberty, just before the group gets together to watch a movie in the Movie Theater. Imagine you can live this life everyday in Palacio Del Mar, Northern Baja’s first Luxury Condo and Spa Development, with the first 25000ft². ocean front club house on the coast. The amenities far outreach any on the coast. The building is designed with lifestyle in mind, the lobby opens up to 16ft high ceilings a library with fireplace, a movie theater a business center and a separate bar and pool table area. The units are only 4 per floor making for large floor plans as well as top notch standards. This 10 ache luxury Baja Resort is as nice as anything one would find in La Jolla Del Mar or Malibu California or even Los Cabo San Lucas in Baja California Sur or Puerto Vallarta, The only difference is that this Luxury starts in the high 300,000’s with a property tax of approximately $600 dollars a year. Palacio Del Mar in Rosarito is now where Cabo was15 years ago. If you missed out then you still have a second chance. Weather Palacio is a second home where you can still enjoy the comforts of the US and yet take advantage of the Baja Life Style or a Baja real estate investment. Now imagine yourself calling the shuttle from you condo to arrange a shuttle service to take you to the Guadalupe Valley in Ensenada Mexico finest wine region for dinner. Call today for a free tour while units are still available in the First Tower. 1-800-678-7583. The current market makes Palacio Del Mar the best investment for retirement years. 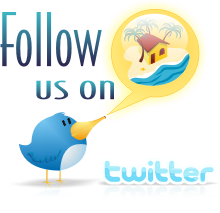 Vist us for more Rosarito Real Estate. Deciding to invest in a foreign real estate market can be a scary decision when the construction projects is finished and even when they are turn key ready, a lot of uncertainty and doubts arise when it comes to purchasing real estate outside of your home country; this uneasiness only increases when there is partial or no actual construction assuring the investor of their purchase. Costal Baja has long been a preferred choice of retirement, relocation or vacation for Americans who want the lower cost beach front living experience, and the closeness to the US. This brought a growing number of real estate developers to Northern Baja, and construction of resort communities designed for expatriates were being developed all along the coast. Whenever someone is looking to buy a Baja Condo with panoramic ocean views from the Pacific, this is what they mean. 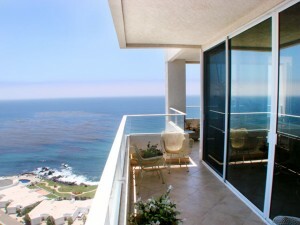 This beautiful oceanfront condo features floor to ceiling windows who let in all the Pacific blue your eyes can take. With natural light throughout this unit, a comfortable feel will welcome you the minute you first step in. Travertine counter tops and ceramic tile on floors and bathrooms are among the upgraded features this oceanfront condo offers. The master bedroom has a private balcony that offers side to side panoramic views, even from the bed itself! Also, the master bedroom connects to the living room balcony through a glass door, offering elite convenience and access. The master bathroom features a panoramic window that lets you have a glimpse of the master bedroom and the ocean itself! The kitchen holds clear ocean view from any point, fine appliances and travertine counter tops throughout, preparing meals has never been more enjoyably. The living room and dining areas are tastefully furnished and optimized for small reunions and to take advantage of the beautiful sunsets Baja offers. Electric drapes will soothe down the ambiance tone and the flip of a switch. 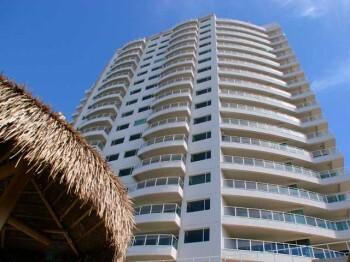 This unit its among the best Baja real estate deals you will find in the Gold coast. Nestled inside one of the finest and most well established communities in Baja California, Calafia Condos and Villas offers a range of amenities and security features at affordable prices. Developed in such a way that allows you to experience the beauty of both the Pacific and Baja, residents enjoy gorgeous sunrises and sunsets all year long. Breathtaking wall to wall views, granite kitchens, travertine bathrooms, Mexican tile flooring and an array of community appointments allow for residents to simply relax and enjoy the surroundings. Schedule a showing with us, call (619)-309-9537 or (619)- 200-7408 see more information on this Baja Condo for sale at Calafia Condos. Americans struggling with the economy are finding relief south of the border. The overall lower cost of living, affordable beach front housing, lower property taxes as well as proximity and accessibility to US services, have made Baja California a preferred choice for relocation among retirees and families alike. ROSARITO, BAJA CALIFORNIA. MEXICO – Many Americans with reduced and fixed incomes are looking outside of the US for retirement and economic relief in these tough times, finding it just south of the border. Baja California, Mexico is leading the trend to cater to retirees, by offering services that appeal to the growing number of foreign residents. These services include assisted living, property and personal care among others at significantly lower prices than in the US. US store names like Home Depot, Wal-Mart, Smart and Final, Applebee’s and Ashley Furniture are some of which are becoming more common in strip malls around the area. State of the art medical facilities equal to those on the US have been and are being constructed in order to provide quality medical care services to the growing number of foreign residents, the only difference being the lower cost. The area between Rosarito and Ensenada just 45 minutes south of the border has become the preferred area, for new Baja real estate where developers are also getting on board by bringing amenities to these new homeowners. Calafia Condos & Villas is one of these developments, where their new tower offers more amenities and social atmosphere for people with an active lifestyle. Plus, it is pet friendly. Some of these amenities include a club house with a TV room, game room, computer area, large gym, outdoor and a private Jacuzzi. These amenities are becoming standard for new communities. Palacio Del Mar, Luxury Ocean Front Condos & Villas, has built the first 25,000 square ft ocean front club house, that will not only have an ocean front infinity pool, spa, saunas, gym and bistro, they also offer an indoor granite bottom pool. A current resident of Northern Baja, Karen Erstad says “I purchased a second home in Las Gaviotas , (an established Northern Baja community), over 10 years ago with the intent to someday live my retirement years by the Ocean”. When she decided on early retirement and make her move, her family and friends thought she was not on her right mind. Even though she would be only a 2 hour drive away, their primary concern was medical care and the question of who would look after her. Some doctors in this Rosarito-Ensenada area are willing and do still make house calls; there are also excellent medical facilities throughout the state. Serena Senior Care is a corporation dedicated to improve the quality of life for senior residents in Baja; among their services are nursing assistance and doctor visits, which gives family members’ peace of mind. In addition, ocean front developments in Baja are largely inhabited by expatriates making them very tight communities, who look out for one another. Karen continues by adding “I can also put my own concerns at ease, by moving to Mexico I can live the same lifestyle if not a better one as if I were still working”. Grocery bill around 250 dollars a month for a small family. Cost of a movie for two people from less than 11 dollars including popcorn. Doctor’s visits starting at around 20 dollars. Internet Access and Cable TV from 60 dollars. Property taxes average 300.00 dollars and up per year. Traditional Mexican food, complete meals from around 4 dollars. 5 star meal starts at 20 dollars per person. Most of these coastal Baja developments, like Calafia Condos & Villas are also located just 10 to 15 minutes from the newest hospital in the area. Downtown shopping, and a 45 minute drive to the wine country, where on Wednesdays and Saturdays they offer an organic farmers market. Living in these communities Americans have the same lifestyle as they currently have back at their homeland but for much less. Max Katz owner of Baja Real Estate Group says “Due to the entire housing inventory on the coast, developers set themselves apart by offering more amenities, services and discounts”. He continues saying, “Not only the newer developments are following the trends, even long time established communities such as Las Gaviotas, an ocean front community that has been a model of success for retirees over the last 35 years, are upgrading to larger gyms, creating social committees and having weekly golf and tennis tournaments”. Clearly, relocating to Northern Baja California has become a solution for Baby Boomers and American retirees against the economic crisis. Especially for those who would like to remain closer to their families and amenities in the US. For others, is just good business.